When we take a look at hard drive sizes, we usually see drives that reach 300 to 500 gigabytes. That’s a lot of space – and we usually take advantage of that fact. Our hard drives are usually filled with photos, videos, music and a dozen other file types that hog up all that space. So what happens when it all comes crashing down? Hard drives are machines like any other and they are susceptible to failure. When a hard drive crashes, it can take along a lot of other things with it. Files on a hard drive can range from vitally important to sentimental in value; if you haven’t backed them up yet, you’ll have to face the fact that you need to recover your crashed hard drive. How do you know when your hard drive is about to break down? There’s no exact science for predicting when it’ll happen. The best hints are when your PC slows down when you’re accessing data or strange noises start to come from the drive whenever it’s in operation. When this starts to happen, it is best to start backing stuff up. However, hard drive failure can still hit without warning. This means you need start trying to fix it. This is because data lost during a hard drive failure are still there – but you need to act quickly before it degrades. Crashed hard drive recovery can range from simple to difficult. Here are some options. Detach your hard drive from your PC and use an external hard drive case. This will enable you to hook up your hard drive via USB and retrieve the data from another computer. If that doesn’t work, you can also clone your hard drive using imaging software. This doesn’t always work properly, but when you’re desperate, every little bit helps. A lot of data-recovery specialists also swear on freezing your broken hard drive so that it can work again. You’re supposed to seal it in a watertight baggy and put it in your fridge’s freezer for 12 to 24 hours. After getting it out, hook it up and get the data out quickly before it heats up again and crashes. Data Recovery Pro wes created with the single purpose of saving your data from being wiped out forever. 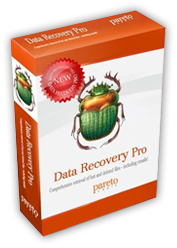 Recovering a crashed hard drive is quick and simple for Data Recovery Pro. Simply download the software, scan your hard drive, and restore the data. It is that easy. Layered security is a wonderful thing. Password protection at the network, system, application, and file level greatly increases the effectiveness of the simple password architecture found in the Microsoft Office suite of products. Unfortunately, losing one of those passwords can restrict access to important files or applications causing a potential loss of data, inconvenience, and lost productivity. In order to gain access to files and applications for which you have lost or forgotten your password, check out Office Password Recovery. 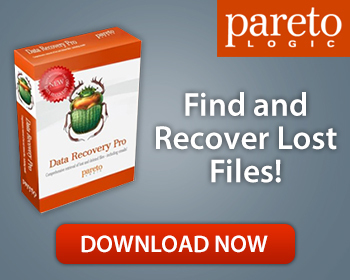 ParetoLogic’s Data Recovery Pro is a simple yet effective file recovery software that allows users to recover accidentally deleted emails, attachments, and files; as well as recover data lost to bad sectors on a hard drive or other unforeseen events. ParetoLogic’s Data Recovery Pro has won multiple awards including Viatech’s innovative excellence and Technology Company of the Year awards. The program is considered one of the best data recovery software on the market. Microsoft Outlook contacts, email messages, notes, folders and more are stored and indexed by the .pst file. If this file becomes corrupted ,Outlook typically can’t run the profile associated with that .pst file. If you’re a business person, and that profile happens to be yours, you might as well not bother showing up to work. As we integrate more of our daily personal and business activities with Microsoft Outlook, we leave ourselves vulnerable to a corrupted .pst file. For times when renaming the .pst file and copying it over just don’t fix the problem, look to Stellar Phoenix Outlook Repair as a viable solution. The heart of nearly any small, medium, or enterprise business is the information stored in its database. With so much riding on the information and associations made in a SQL database, the thought of corrupt or lost information, procedures, or associates is devastating. For small businesses without dedicated DBA support, Stellar Phoenix SQL Database Recovery Software may be all that stands between salvation and ruin. No one will argue that Apple revolutionized the portable entertainment market with the introduction and continual evolution of the iPod. As the device has gained acceptance and dominance, users have transitioned from using it as a dedicated MP3 player, to storing personal information, contacts, videos, pictures, and of course, music. With users adopting the increasingly robust capabilities of the iPod, more data is trusted to these devices. Unfortunately, even iPods can be corrupted resulting in the loss of important data. When this happens, look to Stellar Phoenix iPod Data Recovery to put you back in touch with your missing data. Excel spreadsheets are used for everything from tracking corporate expenses and productivity to managing personal items such as household inventories for insurance claims, or things as simple as the weekly grocery list. With such common use, and interdependence in our daily lives, losing an Excel spreadsheet can be a disastrous experience. Thankfully Stellar Excel Recovery offers a means to recover lost Excel or corrupted Excel spreadsheets and the priceless data they contain. Data loss happens frequently. It may be due to hardware failures, accidentally formatting the wrong volume of a drive, software corruption, viruses, and simply deleting files by mistake. If you are using a Mac laptop or computer (iMac, MacBook Pro, Air, Mac Mini, Mac Pro), you don’t have to throw up your hands and just submit to the loss of important data and files. Stellar Phoenix Mac Recovery is a utility that allows its users to recover Mac files such as documents, images, music or videos that may have been lost by any of the means mentioned above. Over the past 7+ years, the world has increasingly gravitated towards Apple’s iPod. Initially an .mp3 player, the iPod has grown to include touch screen capabilities in certain models, the ability to manage calendars, contacts, video, pictures, applications, and yes music. Current models can store up to 160gigabytes of data. That is a lot of music to have in your hands, and inevitably, some of it could conceivably get lost. So what does one do if they find themselves in a situation where the music they used to enjoy is missing from their favorite personal electronics device? Thankfully there are a couple solutions ranging from using iTunes, to purchasing third party software to recover iPod music and files.